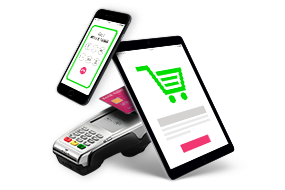 If you would like to use the fraud prevention tools that are available on your account you will first need to activate these within your MySagePay. To do this click on the Settings tab, followed by AVS/CV2. 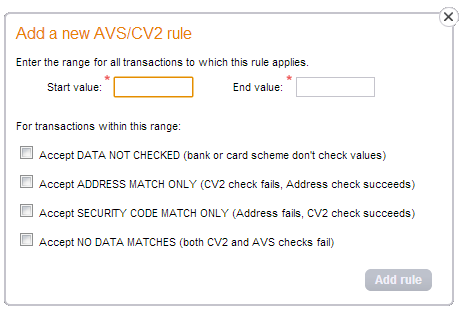 You will then be able to activate the AVS/CV2 checks and manage the AVS and CV2 rules within your account. 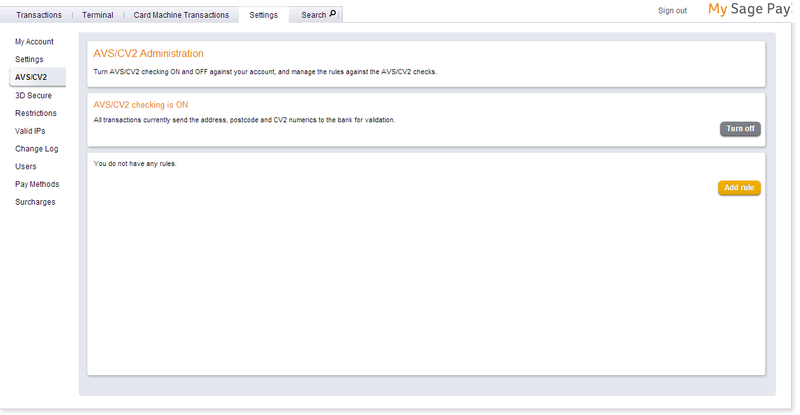 Now that you have activated AVS/CV2 you are able to add rules to your account. By selecting Add Rule within your MySagePay you are able to add conditions to your account based upon the results of the AVS/CV2 checks. Once you have selected Add Rule you will then be presented with the “Add a new AVS/CV2 rule” screen. Within this screen you are presented with 4 options when adding rules to your account. You are free to select as many, or as few of these options as you see fit. Accept DATA NOT CHECKED – Both the address, postcode, and security code checks we not carried out and no results were provided. Accept ADDRESS MATCH ONLY – The address and postcode checks have passed validation, but the security code checks failed. Accept SECURITY CODE MATCH ONLY – The security code checks have passed, but the address, and postcode checks have failed. Accept NO DATA MATCHES – Both the address, postcode, and security code checks have all failed. 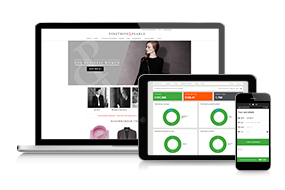 Each option that is selected will allow transactions that meet the criteria to be successful. Now that you have added one rule to your account you are able to have more. When adding another rule you cannot have the start, or end values overlapping in any form. Multiple rules are used when you would like additional security over multiple price ranges. 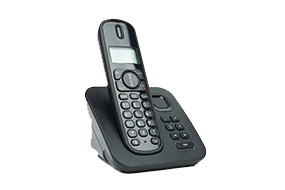 This also enables you to vary the levels of security depending on the price ranges you wish to implement.